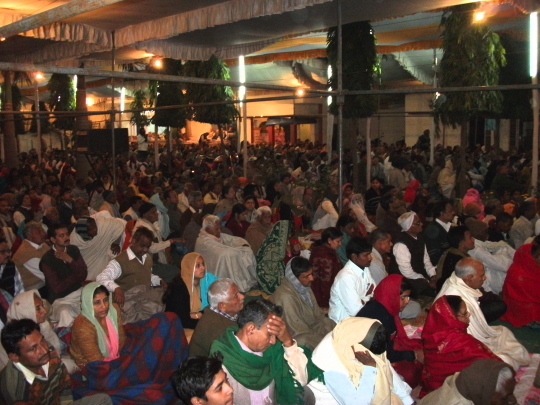 At the RSM satsang held in Indiranagar in Lucknow (© 2011 Ramesh Avadhani). Normally, it’s not too difficult to gain a reasonably dispassionate perspective about any organization; there are people within and without willing to put forward their views. But when the organization is little known and also prefers to avoid publicity, the task becomes a challenge; it takes time to ferret out the right sources of information. So it was when I set out to write about Ramashram Satsang, Mathura (RSM) . But, when roughly half of India’s population is less than 30 years old and browses all kinds of media for information, can RSM afford to ignore publicity? Fair enough. Still, RSM hasn’t underestimated the power of the printed word. The organization brings out a fair amount of pamphlets and booklets in both Hindi and English. Also, since 1933, it has published a monthly journal in Hindi called Sadhan. In fact, I met Anand at a celebration at his house in honor of his cousin, late Om Prakash Biral, who was closely associated with the journal. 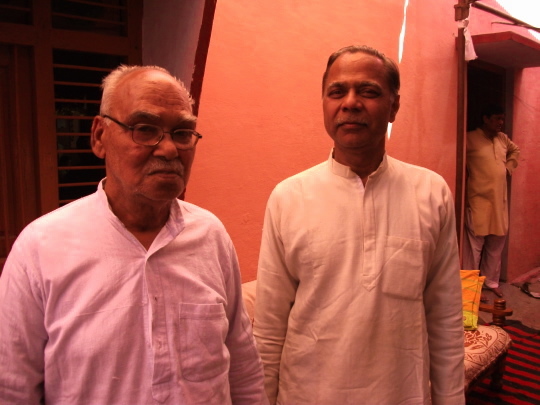 KK Srivastava with Anand Prakash Kulshrestha at the birth centenary celebration of the latter’s cousin, the late Om Prakash Biral, who was closely associated with ‘Sadhan’, the monthly Hindi journal of RSM (© 2011 Ramesh Avadhani). As I was busy with other writing work I couldn’t go to the satsang, but some months later, Srivatsava dragged me to another organized on Basant Panchami, the day signaling the onset of spring in India. The event was held in an upscale district called Indiranagar. Even before I settled down on the carpeted ground with four hundred or so other satsangis, both men and women, almost all middle-aged or elderly, with a sprinkling of youth, I sensed a soothing aura about the place-the flowing white silks of the marquee overhead, birds trilling outside, the moderate chill of a February morning, and the unostentatious voice of a woman singing a tribute in rustic Hindi. The tribute was to Dr. Chaturbhuj Sahay, who is of course no more. Nor is any of the first generation of his closest disciples. It’s the second and third generations who are propagating his teachings, mostly in northern India and countries like USA, Germany, Sweden, and Canada. “We are not in southern India because a number of movements are already there, like Sathya Sai Baba, Art of Living of Ravi Shankar, Isha of Sadhguru, and Oneness of Amma-Bhagwan. People seem happy with them. Good. We don’t have a problem,” said Prabhu Dayal Sharma, 78, with a gentle laugh. He and his brother, Krishna Kant, 74, are the top leaders or achars of the RSM strand based in Tundla, 25 kilometers south of Agra. 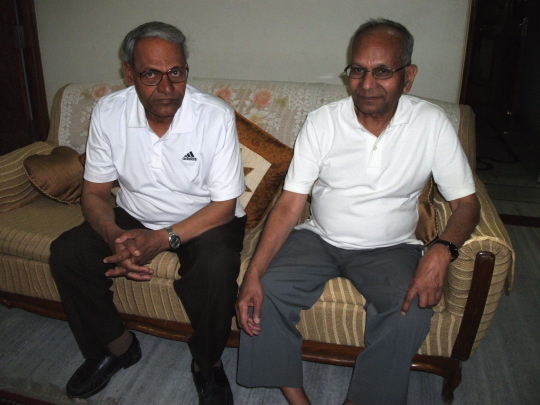 This strand evolved from their late father’s, Pundit Mihi Lal’s, close association with Dr. Sahay. Mihi Lal is acknowledged by RSM to have made the ‘most important and extensive’ contribution to the proliferation of the movement in India after Dr. Sahay’s demise in 1957. After all, Devraj continued, his sunglasses flashing from side to side to take in the audience, didn’t Lord Krishna advice the Pandava warrior Arjuna on a vital precept of Hindu spiritualism? – Those that are peaceful both in joy and sorrow are in satsang with me. Devraj also talked about Gautama Buddha, who, when approaching death, told his disciples not to fret-because that which never was will cease to be, and that which was will continue to be. The Achar siblings Prabhu Dayal Sharma and Krishna Kant preside over a sacred thread ceremony of one of the followers of RSM (© 2011 Ramesh Avadhani). Evidently, RSM is not shy of drawing inspiration from diverse religions. In fact, Dr. Sahay was the closest disciple of Ramchandra Lala of Farukkabad (RSM is named after Ramchandra), who in turn is believed to have gained enlightenment from a Sufi saint, Maulana Shah Fazal Ahmad Khan, in the early 1900s (when Ramachandra was only 18). B.S. 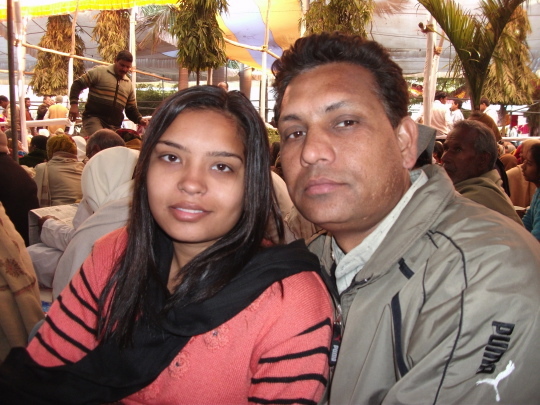 Saxena and Raghunath Prasad who flew in from the US for the Mathura Mela (© 2011 Ramesh Avadhani). After another speaker dwelt on the Ten Principles  of the Ramashram Satsang philosophy, there was a call for meditation. Srivastava had told me something about the Ramashram Meditation Technique: that it’s practiced twenty minutes each in the morning and evening, that the process involved imagining your chosen guru whose heart radiates a ray of light and enters your own heart. The light, of course, as in several religions, symbolizes divinity and is believed to bring you closer to the guru who is considered to be a representative of the Divine. I had personal experience of another technique, Transcendental Meditation or TM, made popular by Maharishi Mahesh Yogi during the 1960’s and 70’s. Maharishi enjoyed a good amount of success in spreading his TM technique and one reason was he unleashed regular publicity blitzkriegs, full page advertisements in newspapers and magazines, something unheard of those days in spiritual movements. I remember being captivated by one such ad and paying fifteen rupees or so for getting initiated into the technique in Bangalore, southern India. His transcendental meditation technique, also of twenty minute duration twice a day, involves sitting in a comfortable posture, preferably in a dark room, with eyes closed and repeating a mantra silently in the mind and gently reining the mind back to the mantra should other thoughts surface. The repetition of the mantra leads to a stage where it dissolves and one experiences a state of extreme restfulness even as all senses are tuned up to peak alertness. In its simplest effect, Maharishi claimed that regular practice of TM would help the practitioner combat the rigors of daily living in a ‘creative’ manner-in fact, his organization in India was initially called the Science of Creative Intelligence. In the broader aspect, Maharishi extolled that if a ‘critical mass’ (1%) of our population practices TM regularly, a ‘Golden Age of Enlightenment’ would dawn on India; an era that would see heightened consciousness, falling crime rates, greater cooperation between government and people, and all round improvement in living conditions. Poverty, corruption, illiteracy, poor healthcare, and all the other ills that bedeviled India for so long would be consigned to the dustbin. But, later, Maharishi started dabbling in advanced siddhi techniques (one of which was supposed to enable the practitioner to ‘fly’) and also setting up a kind of government, complete with ministers and secretaries, that offered consultancy to other governments! It all became a rather far-fetched exercise and started to lose support amongst his own followers. However, regarding the TM technique, I for one still vouch for its effectiveness. Next, four volunteers materialized with bags in their hands near the dais. Like farmers scattering seeds in a freshly tilled land, they came striding through the audience, handing out prasad left and right-golden brown sweet samosas. A sensual flourish to matters spiritual. “Oh, there is lunch too,” said Srivatsava with visible relish. March was some weeks away. So, I went to meet Dr. Brijesh Kumar Shukla, head of the Sanskrit Department at Lucknow University and an authority on the history of Hindu religion. 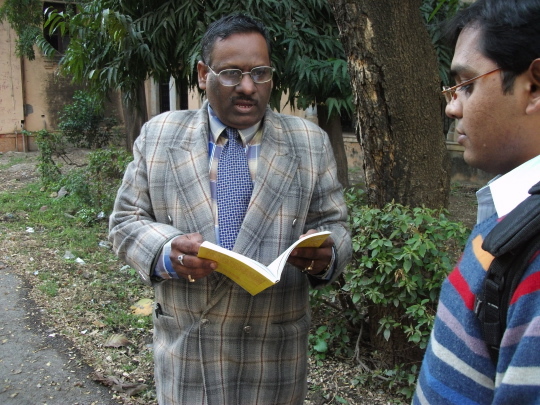 Dr. Rajesh Kumar Shukla, Head of the Sanskrit Department, Lucknow University, in discussion with one of his students (© 2011 Ramesh Avadhani). The Alwars came from a diverse strata of society (one Alwar is believed to have been a woman-Andal– and quite a few were from the lower caste of Shudras of the four-tiered caste system  which still exists amongst Hindus). These poet saints collectively authored the Dravidnamnay-most importantly, the Nalayiram Divya Prabandham or 4000 verses–considered equivalent to the Vedas. The quintessence of the Bhakti movement was that rituals and sacrifices as prescribed by the Vedas (India’s most ancient scriptures, about 2500 years old, and believed to be the starting point of all recorded history of this country) weren’t necessary to travel the spiritual path, caste and gender were immaterial, but total surrender to a realized soul was essential to experience divinity. The Bhakti movement gradually spread northwards from Tamil Nadu and caught the imagination of the rest of India. “Bhakti was born in Tamil Nadu, blossomed in Maharashtra, aged in Gujarat, and danced in Vrindavan,” said Dr. Hari Mohan Malviya, Director of the Vrindavan Research Institute. 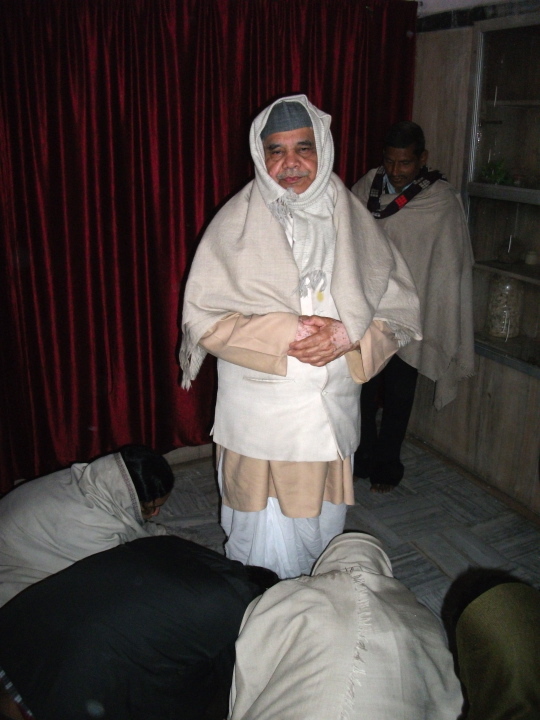 Dr. Malviya was to later elaborate on key aspects of the spiritual and societal scenario of the 19th and 20th Centuries, corresponding roughly to the period when the Sufi saint, Maulana Shah Fazal Ahmad Khan, and his disciples in succession, Ramchandra Lala and Dr. Chaturbhuj Sahay lived. 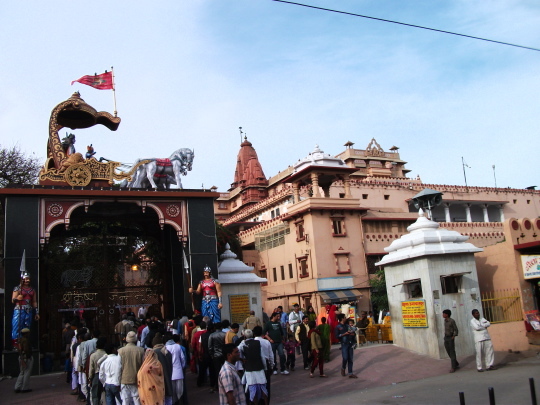 Vrindavan, about 25 kilometers from Mathura, is a small town of beautiful temples. This brings us to the great Ramanujacharya of the early 11th Century, who authored brilliant scriptural treatises like Brahm Sutra. He was not only a huge proponent of the Bhakti movement but also a believer in the equality of all castes. In fact, as a young man he eulogized a temple cleaner belonging to the lower caste who was utterly devoted to the idol of Vishnu. The cleaner, horrified at the young Brahmin Ramunuja’s admiration, mistook it as mockery. Such nobility of outlook was to remain a hallmark of Ramanujacharya all his life. He even left his wife when she, still holding fast to her orthodox views, disparaged the ‘lowly born’ wife of one of his gurus. Clearly, a case of man not being a prophet in his own family! What then of an entire society outside the family, as happened later when the Vaishnos of Ramanujacharya split into two streams-the Vadagalai and Thengalai sects and differences in rituals, thoughts, caste, tattoos and marks and even attire crept back into society. Perhaps Ramanujacharya’s remains, believed to be buried in the Srirangam Temple in Tamil Nadu in southern India, squirms every now and then in utter disappointment. Ramanujacharya, while following the basic tenets of the Bhakti movement, considered Vishnu as the Supreme Being, not Shiva as propounded by Adi Shankaracharya of northern India (7th Century AD). Of course, Ramanujacharya’s work covers many more major aspects of Hindu philosophy which are outside the scope of this article. Suffice to say that he polarized Hinduism in a way never done before: worshippers of Shiva and worshippers of Vishnu-advaita (non-duality or absolute oneness of the supreme; everything else is temporary and illusory) and vishishtadvaita (qualified non-dualism or several unique attributes of the Supreme; everything–the universe and the souls–is real as they issue from the supreme). Then the Ram Bhakti (devotee of Lord Ram) movement arrived. This was around the time of King Rama of Ayodhya, about 7300 BCE (according to Hindus). Rama came to be considered as an avatar of Lord Vishnu because of his nobility as son, king, and husband, his unshakeable resolve of meting out punishment to the evil as personified by the demon Ravana who abducted Rama’s wife, Sita. Worship of Rama took pre-eminence over other gods and was vigorously advocated by saints like Tulsidas and Surdas. The next major change was the era of Krishna (about 3300 BCE) also considered an avatar of Lord Vishnu. Krishna helped the five Pandava brothers fight their hundred cousins, the Kurus, in the great Mahabharata war for justice. Krishna showed his brother-in-law, Arjuna, the master archer of the Pandavas, the dharmic or righteous way of life. This was the sermon as contained in the Bhagavad-Gita  which Mahatma Gandhi however considered as a treatise on the tussle between evil and good in the hearts of everyone, and equivalent to Christ’s Sermon on the Mount. Since there were a huge number of stories and legends woven around Krishna, and poet saints like Mirabai authored a number of songs in his honor, people found it more attractive to worship him. Rama faded into the background. Next were the great Hindu renaissances, the Bhakti Movement of the Alwars and the Vaishnovism of Ramanujacharya. Although they didn’t displace Shiva worship as extolled by Shankaracharya, they had a lasting impact down the centuries all over India, and inspired a number of spiritual figures. In this context, Ramashram Satsang could be viewed as a movement that strives to bring together salient points of several religions in a unified approach towards spiritualism. Perhaps therein lays its difficulty in spreading such an evolved view rapidly amongst society. For example, not all members of KK Srivastava’s own family believe in RSM. “It’s their choice,” he said, but a tremor of disappointment showed in his tone. The small town of Tundla is a night’s journey by train from Lucknow and I got off at the station at 5.30 am only because the train stopped there for a long time; I was woken by the call of tea vendors shouting ‘Chai…garam chai‘ – tea…hot tea! Outside, a steady drizzle fell and there were virtually no street-lights. The Ramashram Satsang was a kilometer away on the main road. I boarded a cycle rickshaw. It was a unique experience, entering a new town at the wisp of an amorphous dawn, riding with a bulging suitcase in a three-wheeled manually driven contraption, and the light shower of rain somehow adding to the tension I was already experiencing as I was going to meet the top leaders of a spiritual movement. I couldn’t shake off the feeling that I was alternating between two states of consciousness–a journalist who wanted to be objective, and an insignificant soul who wanted to get close to someone who had experienced a higher power and thereby gain some assurance that I wasn’t all that insignificant. Ramashram Satsang Bhavan at Tundla (© 2011 Ramesh Avadhani). The ashram was a large hall with a garden in front, washroom facilities at one side and a prayer room at the back. The hall acted as a sort of dormitory for devotees. There were about fifty of them, laid out or squatting on jamkhanas or cotton carpets, getting ready for the Morning Prayer that was to be graced by the siblings. 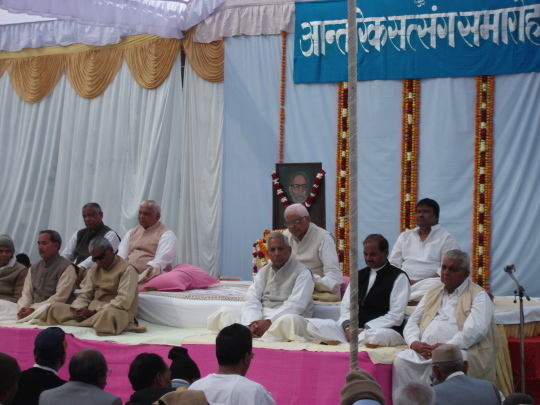 In the middle on one side was a bust of the siblings’ father, Pundit Mihi Lal, the close disciple of Dr. Sahay. People went up, stood with folded hands, and bent to touch their foreheads to the bust. 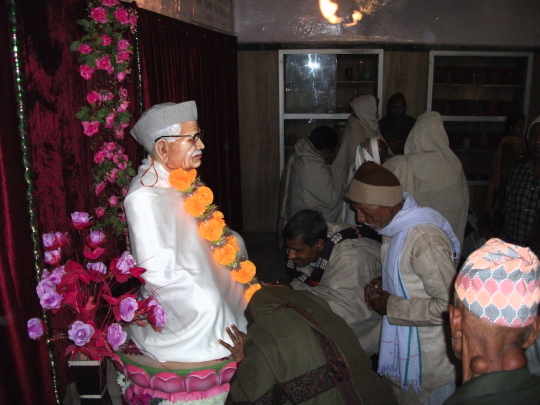 Devotees pay homage to the bust of Pundit Mihi Lal, close associate of Dr Chaturbhuj Sahay, founder of RSM, at Ramashram Satsang Bhavan, Tundla (© 2011 Ramesh Avadhani). The elderly siblings arrived and bade us accompany them to the prayer hall at the back. Everyone hurried there, keeping their luggage in the hall, but since there was a notice in Hindi that one was responsible for one’s belongings, I lugged my suitcase to the prayer room. I was, it turned out, the only one who had done so. Prabhu Dayal glanced at my suitcase with amusement. For the next forty five minutes, there was prayer, singing, and meditation, much like the Indiranagar satsang. 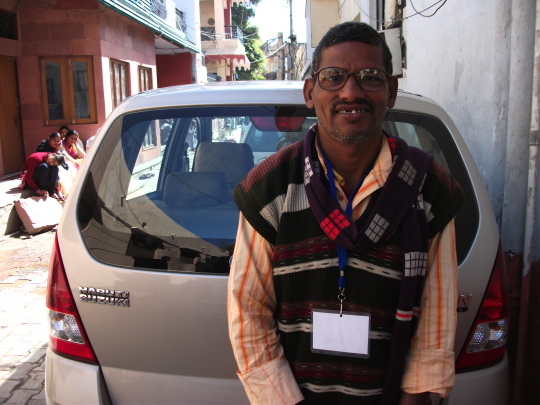 Later, Prabhu Dayal asked me to follow him to his house, “for breakfast and talk”. 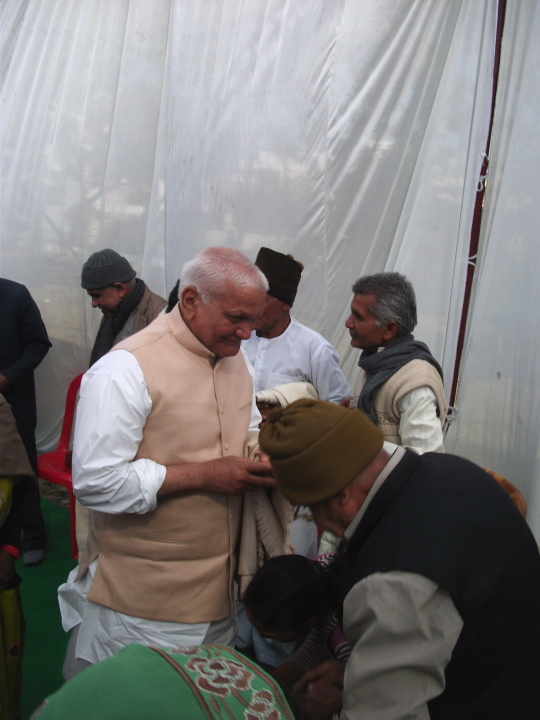 Devotees seek blessings of Achar Prabhu Dayal Sharma at RSM, Tundla (© 2011 Ramesh Avadhani). His house was about half a kilometer away, and again it was a never-before experience for me: walking behind a guru who was clad in a nine-yard lungi draped in the traditional style, a muffler looped about his neck, and an assistant holding an umbrella over his head as the drizzle was still on. Somehow everything around, the few shops that had opened, the scarce traffic, the motley pedestrians, took on the sheen of an illusion. Prabhu Dayal’s study, which I had to enter barefoot, was compact, unlike the rest of the house which seemed to extend in every direction on its own. And the first thing that he told me was to keep my suitcase in a mini cloakroom at the back. It was with alacrity and relief that I did so. And then, at the breakfast table where his charming grand-daughter, Shruti, served us porridge, buttered toast, cookies and tea, he said, “Ask me anything. Be frank. I will also be frank.” What better invitation does any journalist need? 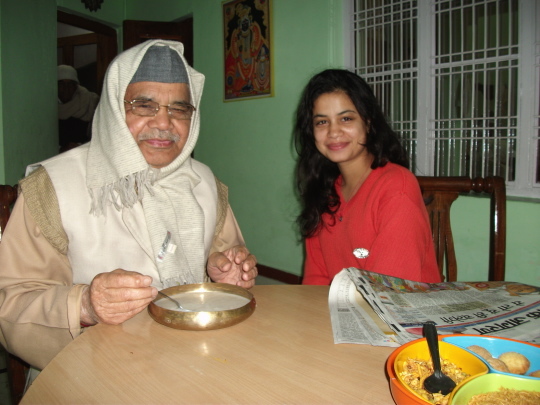 Achar Prabhu Dayal Sharma with his grand-daughter, Shruti (© 2011 Ramesh Avadhani). What spiritual movements prevailed in the 1930s when Dr. Sahay founded RSM? How relevant is RSM in today’s society? 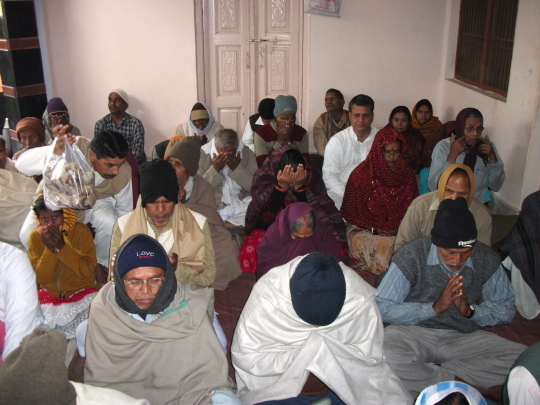 Devotees in a meditation session at RSM, Tundla (© 2011 Ramesh Avadhani). Could he describe his own experience when he guides several hundreds of people on to the path of spiritual realization? Prabhu Dayal was immersed in RSM activities from a young age because of his father, Pundit Mihi Lal, but got fully involved from 1992 when he retired from the Railways as Chief Controller. Did he face any severe challenges to his faith in RSM? How does he coordinate with his brother, Krishna Kant? I did that. Krishna Kant is tall, well-built and with a determined gait. In fact, it’s his habit to walk a few paces ahead of Prabhu Dayal, as if cleaving a path for him through crowds of followers. Krishna Kant was in his study, too, poring over some papers, and when we began to talk, he sounded much more enthusiastic than his elder brother, so much so that anyone would think twenty years separated them, not four. People seek blessings from Achar Krishna Kant (© 2011 Ramesh Avadhani). And then as he ordered tea for me, he wanted to know if I would be attending the Mathura satsang to be held two days hence. I said yes. Eating out on the verandah at RSM, Tundla (© 2011 Ramesh Avadhani). Before I left for Mathura, via Agra and its awesome Taj Mahal, I sat Indian style for a simple meal of rice, chapattis and dal, served on banyan leaves stitched together on the quadrangle floor outside. Shruti appeared in the doorway and watched for a few moments, a half smile playing on her lips. 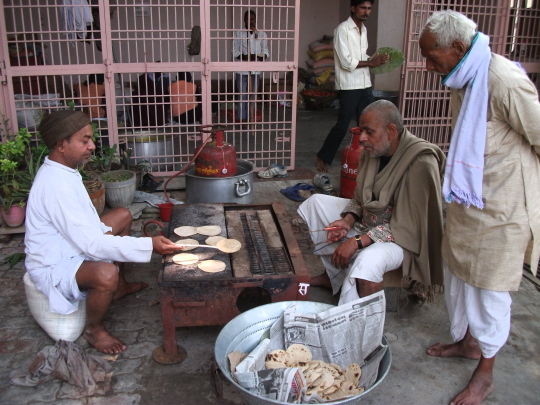 Cooking free meals for devotees at Tundla (© 2011 Ramesh Avadhani). Mathura, believed to be the birthplace of Lord Krishna, evokes much more than smiles-despair, disbelief, and reverence. A busy little town with contradictions that hit all your five senses–dirty streets and irresistible milk-sweets, garish shopping malls and quaint temples on the banks of the River Yamuna (the Dwarkeesh Mandir is popular), hotels that smell of urine and worse and armies of tourists, both Indian and foreign. You might even get to see a handsome middle-aged man who walks the streets stark naked, morning, afternoon, and night, oblivious to the stares and laughter of passersby. Perhaps he is in a state of consciousness that few of us can reach. Homes from which guests go away without having been received even with an offering of a little water are like those holes in the fields which are the homes of jackals. The grand Krishna Temple at His birthplace in Mathura, built by the Birla Family. Atop the entrance archway is the famous scene sculpted from the Bhagavad-Gita–Lord Krishna, the charioteer, advising the Pandava warrior, Arjuna (© 2011 Ramesh Avadhani). The temple stands cheek by jowl with an imposing mosque built by that vicious Mogul king, Aurangzeb (who imprisoned his own father, Shah Jahan, and captured the throne). Both temple and mosque are separated by barbed wire and electrified fencing and heavily patrolled by armed police. Could the Omniscient Krishna have dreamt that his birthplace would turn into a fortress! In contrast to opulent marble and machine-guns, the Ramashram Satsang headquarters in Dampier Nagar district is a flat large mansion that invites you to walk in, tarry awhile, meet and talk with people around and spread out a mat on the open lawns and meditate as much as you want. But even this homely atmosphere transformed into a giant mela or fair for three days. About ten thousand people descended from all over northern India and engulfed the lawns and surrounding streets. Added to this there were vendors of every conceivable household item, giving respite to many housewives from the regular meditation sessions that they were called to over the loudspeakers. 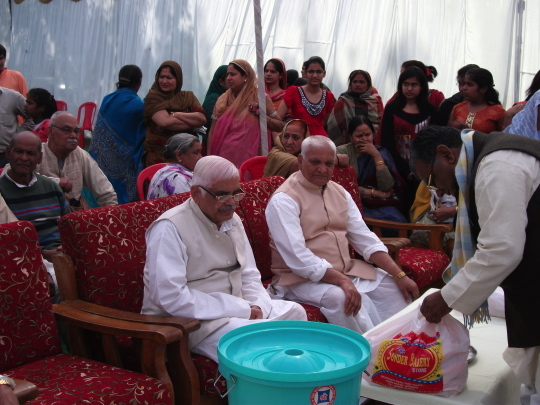 At the RSM mela in Mathura (© 2011 Ramesh Avadhani). At the mansion itself, while the portico played host to speaker after speaker in the mornings and evenings, the entrance was occupied by stalls dispensing scores of spiritual books and pamphlets. It was a reassuring sight-who said reading was in the decline in this age of electronic media? Children less than five years old were imitating adults by gravely turning over pages of spiritual text. 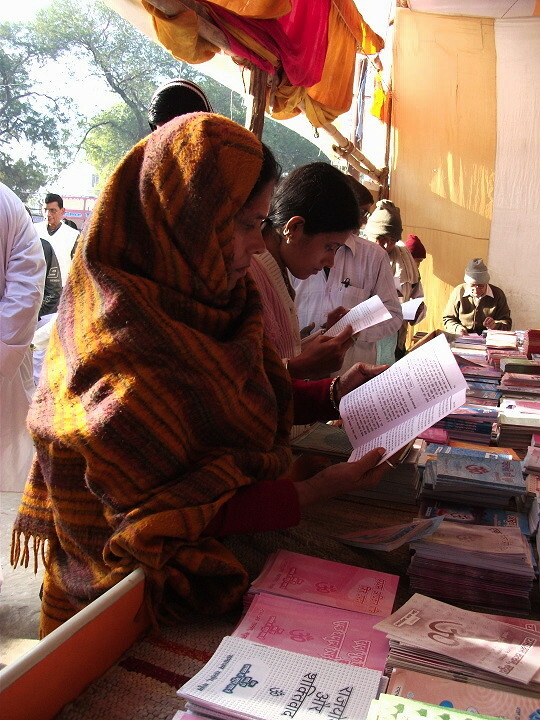 Browsing literature at the Mathura Mela (© 2011 Ramesh Avadhani). Aishwarya, with her father, Maya Ram, at the Mathura Mela. “RSM could be more youthful,” said Aishwarya (© 2011 Ramesh Avadhani). Just then a middle-aged couple came up with glasses of tea and wanted to know who I was. When I introduced myself, the man handed me a glass of tea and said, “Later maybe. Not now,” and accosted Jasbir away. Poor man wasn’t able to finish his tea. A journalist is unwanted news for some people. 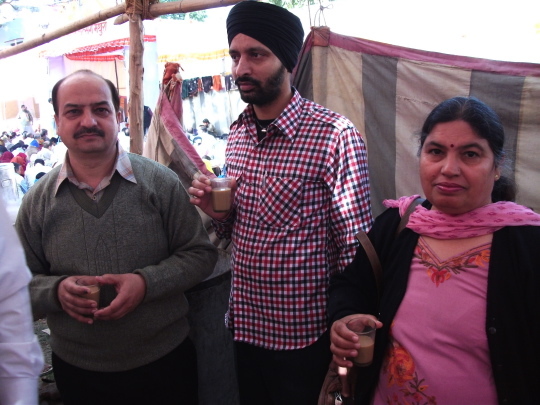 Jasbir Singh from Amritsar poses with the couple who brought him to the Mathura Mela (© 2011 Ramesh Avadhani). 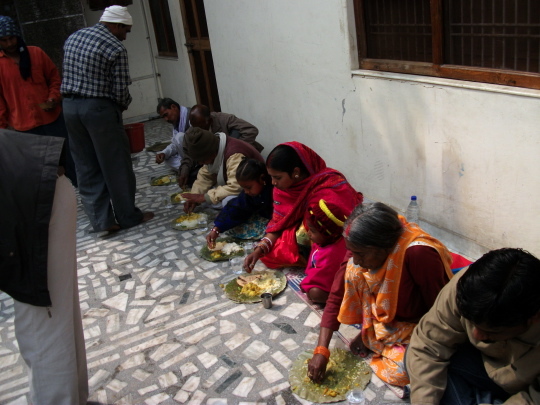 Umakant Sarma from Bihar who has been with RSM for 31 years (© 2011 Ramesh Avadhani). The word ‘indescribable’ is a favorite in RSM lexicon. I heard it once more, this time from a banker, Palav Grego, 28, from Hazaribagh, Bihar. He described RSM not as an organization but as an informal gathering of diverse people brought together by a common wanting-peace. “I have been a satsangi since my birth, probably even before that,” he said and the ring of grandeur in his tone was hard to miss. “You must experience the joy yourself; the joy of meditation, the joy of being with other satsangis…it’s indescribable. You can’t explain it however talented a journalist you are. Can you describe the true experience of tasting a sweet?” Then he said, “Anyway, I am too small a person to be interviewed by you. Sorry.” He refused to be photographed. Naveen Kumar (at right) with his family. He was severely critical of the Mela (© 2011 Ramesh Avadhani). “Well…yes, but the arrangements…” Naveen went on, shaking his head. 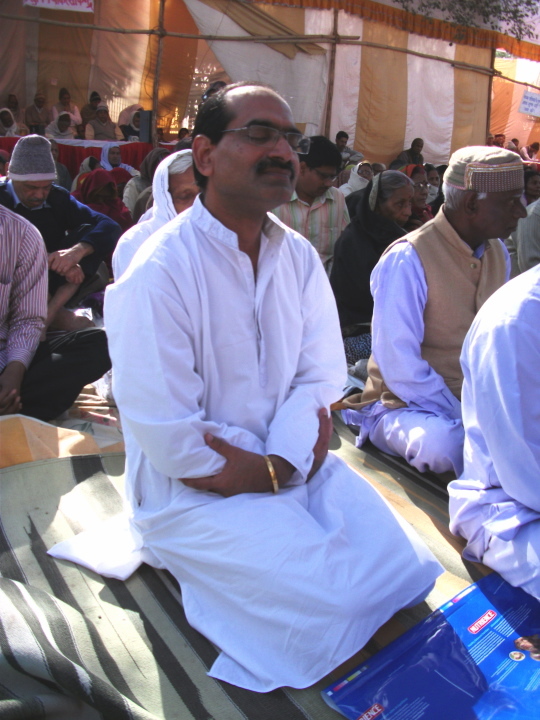 A devotee deep in meditation at the Mathura Mela of RSM (© 2011 Ramesh Avadhani). For the three days of the mela, the town of Mathura reverberated with the hustle and bustle of RSM satsangis-they were out in the markets and temples, shops and restaurants, taking respite from the lectures and meditation sessions. 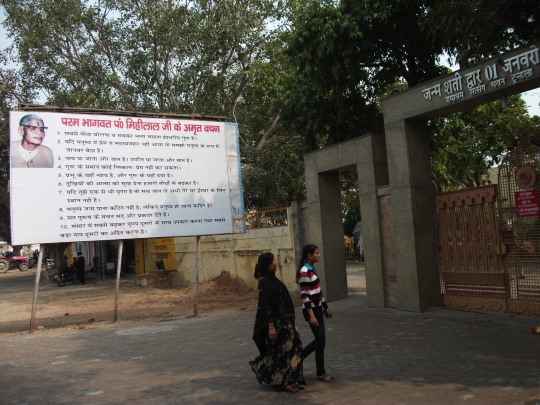 And just 25 kilometers away, a few minutes walk from the grand ISKCON temple in Vrindavan town where Lord Krishna is believed to have played a number of pranks, killed demons and made many a damsel swoon, the director of Vrindavan Research Institute, Dr. Hari Mohan Malviya, said he had not heard of Ramashram Satsang. Dr. Hari Mohan Malviya, Director of the Vrindavan Research Institute in Vrindavan (© 2011 Ramesh Avadhani). “There are many such organizations in India that call themselves spiritual,” he said. “They get registered as non-profit organizations, rake in money by the bushels from gullible donors and avoid paying taxes.” I recounted him briefly my experience so far of RSM, but he remained skeptical. 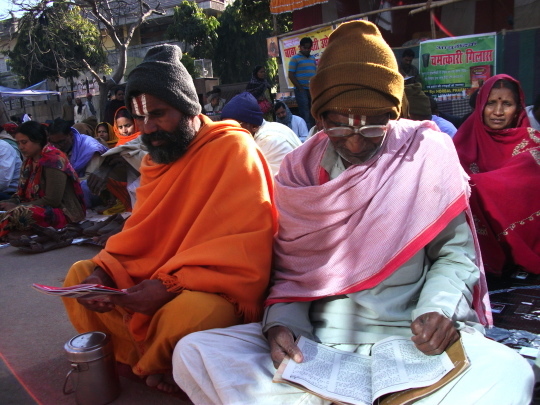 Devotees at the Mathura Mela (© 2011 Ramesh Avadhani). 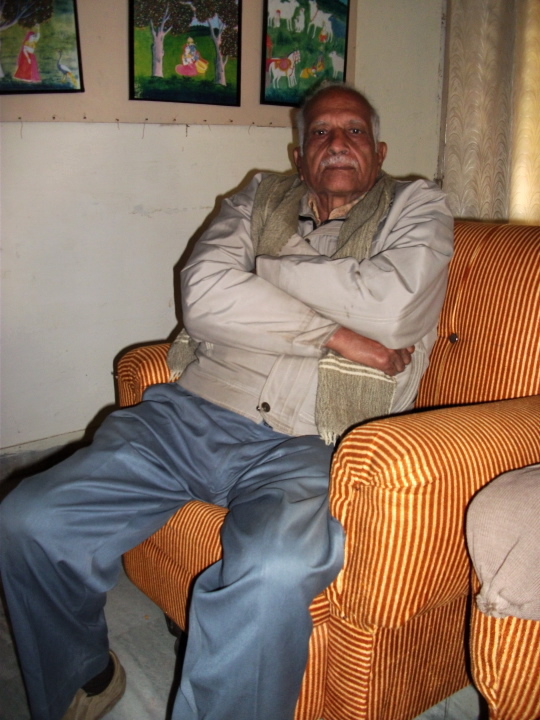 Malviya was principal of an Allahabad college and upon retirement, took up this job to ‘do something worthwhile.’ His spirit of camaraderie has endeared him to his staff; they looked happy and relaxed to be working under him. We sat in the lounge outside his office and he thought for a while about what I had said, about what I needed to know, and then started to draw a composite picture of the social, political and religious scenario that prevailed in Northern India in the 1800s and 1900s. “Those were really heady days of new ideas and reforms, struggle and pain, and small victories and big defeats. It all started with Ram Mohan Roy (1772-1833). He pioneered the Bengal Renaissance for reformation in society and Hinduism. He attacked superstitions, caste system, child marriage, polygamy, and the sati practice where women immolated, or were forced to immolate, themselves in the funeral pyres of their husbands. In fact, he was able to get the British enact a law against sati with the help of William Benting, then Governor of West Bengal. Supported by eminent intellectuals like Debendranath Tagore, he founded the Brahmo Sabha in 1828, the precursor to the Brahmo Samaj or Brahmoism  which came into existence as a new religion, distinct from Hinduism, in Calcutta in 1849 (after Roy’s death in 1833). “Then there was Ishwar Chandra Vidyasagar (1820-1891), litterateur and educationist, who shared Roy’s vision of a casteless society and also propagated widow remarriage. He sought to reform the evils of orthodox Hinduism from within. In fact, although he was from a conservative Brahmin family, he got his son married to a widow. “Or take the case of Pandit Madan Mohan Malviya (1861-1946), born in Allahabad and graduated from Calcutta. He created the largest university in Asia, the Banares Hindu University, with the help of that great sympathizer of India, Dr. Annie Besant. He was also a freedom fighter and politician. President of the Congress Party four times, he was instrumental in establishing the scouting movement in India and joined Mahatma Gandhi in the freedom struggle movement. A reformer of the caste system, he worked tirelessly for the uplift of backward castes, particularly for their entry into Hindu temples. He was the one who coined our national slogan, ‘Satyameva Jayate’ (Truth Alone Will Triumph). Dr. Malviya considered 1893 as a milestone in the Bengal Renaissance. “That was the year when Swami Vivekananda (1863-1902) lectured to the West at the Chicago Parliament of World Religions. His address regarding the richness and tolerance of Hinduism made a great impact on the assembly, and indeed all over the US. He had in one stroke uplifted Hinduism from the morass it was under in the eyes of the British (because of evils like caste system, dowry, and sati) to become a beacon of spiritual light for the whole world. That success reflected back in India and almost overnight he became a huge personality. He was the first to have brought a successful organizational approach to religion. Service to society was his biggest message . Dr. Malviya then spoke of the two great opposing contemporaries from Maharashtra, Gopal Krishna Gokhale (1866-1915) and ‘Lokmanya’ Bal Gangadhar Tilak (1856-1920), famed for their contribution to reforming Hinduism and India’s freedom struggle. “Tilak was known for his aggressiveness whereas Gokhale was exactly the opposite, amiable and conciliatory. They and their respective supporters were known as the ‘Garam Dal’ and the ‘Naram Dal’-the hot faction and the soft faction! Mahatma Gandhi leaned towards Gokhale  although he also respected Tilak . 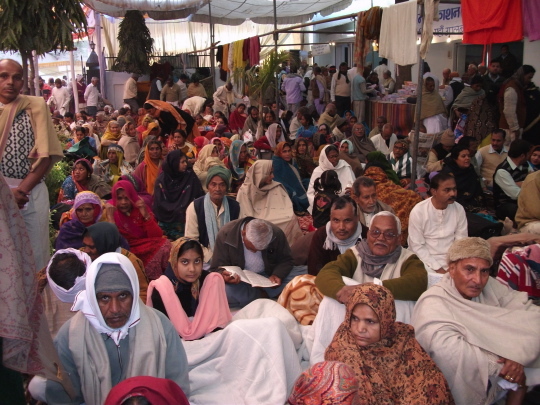 The Mathura Mela drew devotees from all strata of society (© 2011 Ramesh Avadhani). There were many others, said Dr Malviya, who contributed to reform in religion and society. People like Lala Lajpat Rai (1865-1928), the Lion of Punjab, an awe-inspiring freedom fighter, Motilal Nehru (1861-1931) from Kashmir, the progenitor of the Jawaharlal Nehru-Indira Gandhi family, Mahatma Gandhi of course, Rajendra Prasad (1884-1963) from Bihar, who became the first President of India, and Ram Manohar Lohia (1910-1967; eminent freedom fighter and advocate of the backward castes), Hridyanath Kunzru (1887-1978; who led the Indian scouts movement as well as the Servants of India Society founded by Gokhale for several decades), Tej Bahadur Sapru (1875-1949; a great jurist and leader of the Indian Liberal Party), all from Uttar Pradesh…. Scene from the Mathura Mela (© 2011 Ramesh Avadhani). The mystical branch of Islam that is said by some to have pre-dated the rise of Islam in 7th century. Some aspects are believed to be influenced by Buddhism and Hinduism. 1. God is the supreme power with no name or form, and you can choose a name of your liking. 2. To seek him, you need not renounce either the world or the married life; you do not need to live a secluded life nor do you need to become a wanderer. Those living with family and leading a ‘normal’ life can still reach god. 3. In order to attain self-realization, you must find someone who has already attained self-realization and seek his guidance. 4. Bring inner happiness into you life, for it is a divine virtue. 5. Gyan or knowledge brings peace; you will not find it outside. It is within you, so you will need introspection and Satsang to be at peace. 6. You should continue to devote most of your time to your daily activities. However, while practicing Satsang, you should keep your mind clear of all worldly concerns. 7. As a Satsangi (seeker), two activities are very important for you-first, earning an honest living, and second, keeping busy with work. 8. Knowledge is infinite. If your Guru cannot take you to your goal, then seek the guidance of another Guru. However, after finding an Atma-Gyani Guru (self-realized person), you should stay with him. 9. Do all worldly work with a spirit of service, not to rule or to own. 10. Live in this world as a guest. Believe that someone else owns everything in this world. Leave “me and mine”. And learn “you and yours”. Brahmin [priests and learned], Vaishya [traders], Khastriyas [warriors], and Shudras [menial laborers]. The full story is depicted in one of India’s two great epics, The Ramayana. An important part of the other great Indian epic, The Mahabharata. The main features of Brahmoism: God or Singularity is manifest everywhere and in everything, and all beings are created from him. Being exists to be one (again) with God. Righteous actions alone rule Existence against Chaos. Knowledge of pure Conscience (light within) is the One (Supreme) ruler of Existence with no symbol or intermediary. Respect all creations and beings but never worship them for only Singularity can be worshipped. Do not believe in any scripture or authority, or idols, or avatars of the Supreme. Education is the manifestation of perfection already in man. Religion is the manifestation of divinity already in man. Serving man is serving God. Hence each soul is potentially divine. The goal is to manifest this Divinity within by controlling nature, external and internal. One can do this either by work, or worship, or psychic control, or philosophy-by one, or more, or all of these-and be free. This is religion. Doctrines, dogmas, rituals, books, and temples are secondary. Arise, awake and stop not till the goal is reached. He coined the concept of daridra narayana seva – the service of God in and through poor people. “If there truly is the unity of Brahman underlying all phenomena, then on what basis do we regard ourselves as better or worse, or even as better-off or worse-off, than others?” – he asked. No one can be truly free until all of us are. Even the desire for personal salvation has to be given up, and only tireless work for the salvation of others is the true mark of the enlightened person. Vivekananda advised his followers to be holy, unselfish and have shraddha (faith). He encouraged the practice of brahmacharya (celibacy). In one of the conversations with his childhood friend Priya Nath Sinha, he attributes his physical and mental strengths as also eloquence to the practice of brahmacharya. Tilak was known as the “Father of the Indian Unrest” a phrase coined by the British and purported to be derogatory. He was one of the strongest advocates of swaraj or self-rule in Indian consciousness and urged Mahatma Gandhi to adopt any and all means, even violence, to gain it. Tilak coined the memorable slogan: “Swaraj is my birthright, and I shall have it!” And it was he who transformed the household worship of Lord Ganesha into a public celebration in Maharashtra. 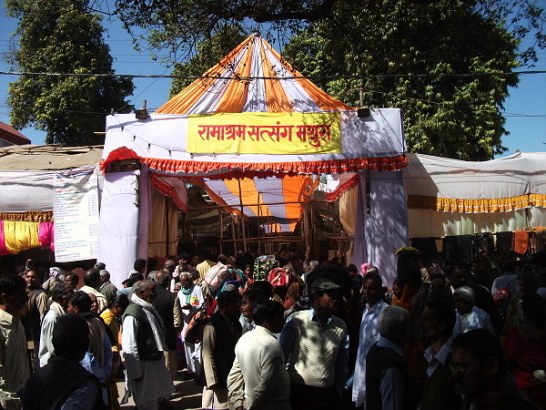 The Arya Samaj, a “universal society” based on the authority of the Vedas, is against idol worship, animal sacrifice, ancestor worship, pilgrimages, priest craft, offerings made in temples, the caste system, untouchability, child marriages and discrimination against women because all these lack Vedic sanction. It also discourages dogma and symbolism and is skeptical of beliefs that run contrary to common sense and logic. Aum or Om is considered by the Arya Samaj to be the highest and most proper name of God.